Info: Heathers is a 1988 American black comedy film. It was written by Daniel Waters and directed by Michael Lehmann. 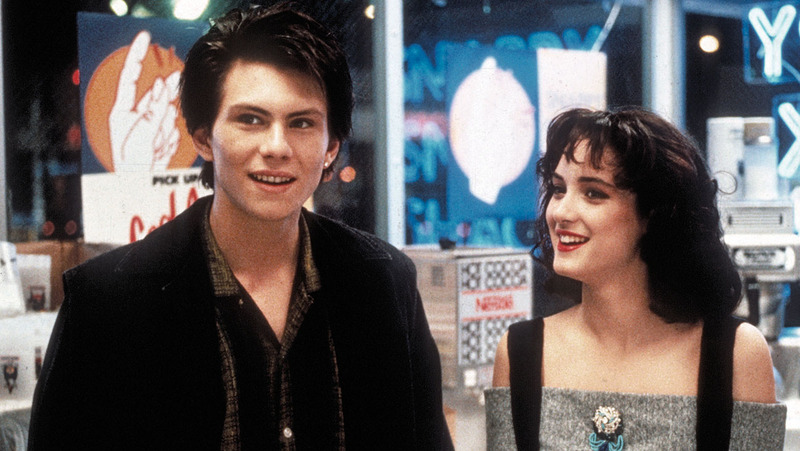 Main stars are Winona Ryder as Veronica, Christian Slater as J.D., and Shannen Doherty as Heather, Lisanne Falk as Heather, Kim Walker as Heather. The movie has also been adapted into a musical. Movie lasts for 1 hour and 43 minutes. Plot: Movie follows high-school group consisting of 4 girls; 3 of which are named Heather and one Veronica who is new in the group. Soon enough, Veronica realizes that all Heathers are mean after they forge a jock's handwriting playing a joke on a overweight girl telling her he likes her. After she is publicly humiliated, Veronica starts her journal saying she wants the leader Heather dead. Then we meet the new student, J.D. who pulls out a gun on two guys trying to scare him and bully him. After that, Veronica is pretty fascinated by him. Hers and Heather's 1 relationship is still weak, but Veronica decides to go to a frat party with her. At the party, she refuses to sleep with the college guy and Heather 1 vows to publicly shame her at the school. The next morning, Veronica and J.D. met and went to Heather's 1 house when J.D. offered her a hungover cure, but it was drain cleaner. Heather died and Veronica wrote a note making it a suicide. Heather 2 took over the group. Two jocks spread a rumor about Veronica which gave her a good idea to pull a prank on them. She was meaning to scare them with guns loaded with fake bullets. However, J.D. replaced those with real ones and both of the guys were killed. Again, Veronica and J.D. covered it up by writing a suicide letter making them a couple that couldn't bare not being in the open with their relationship. The overweight girl from the beginning tries to kills herself by throwing herself in front of the car. However, she is just badly injured and ends up in a wheelchair. Heather 3 then calls a radio station complaining about her life what Heather 2 and Veronica hear and the following day Heather 2 tells her story to the whole school. Heather 3 then attempts suicide during the class, but was stopped by Veronica. Veronica then realized what her life is becoming and tells J.D. she's not doing murders anymore. She also fakes her death by fake-hanging herself in her room because she expected J.D. to come and kill her as he did. He also told her, while he thought she was dead, that he was going to blow up the school. The next day Veronica finds him with bombs and shoots him. The bombs are stopped, but J.D. survives and eventually blows himself up in front of the school. My impression: Starting with the movie being a black comedy. I just thought it was black. There's a lot of dead people and covering up murders, but no comedy at all. I didn't know anything about the movie so I thought the relationship was a cute part, but then it all took the wrong turn. Them killing people and not realizing how serious it is was more annoying than funny. There's also not a lot of plot there. Recommendation: I would definitely not recommend this movie! I know it has pretty high grades on all the sites, but I almost died of boredom. I found the plot very weird and not making any sense. I didn't find it funny at all even though it's supposed to be a comedy. The only good thing about this movie are the actors (young Christian Slater) and they did a good job, but the movie is still terrible to me. There's also a musical and some series. Also, they say it's a base for Mean Girls. Have you watched it? What do you think of it?